For Worldwide Sketchcrawl 27 today I headed to San Francisco on BART for a 10:30 meetup at the Ferry Building, sketching along the way. The couple at the top of the picture seemed to be on an unsatisfactory date. The woman seemed passive-aggressive: she’d gone along with bringing her clunky bike on BART and her stupid, ancient, ill-fitting helmet, but wasn’t going to have fun. Her date adjusted her helmet straps for her but while he kept his on all the way to the city (complete with duct tape patch), she wouldn’t put hers on. 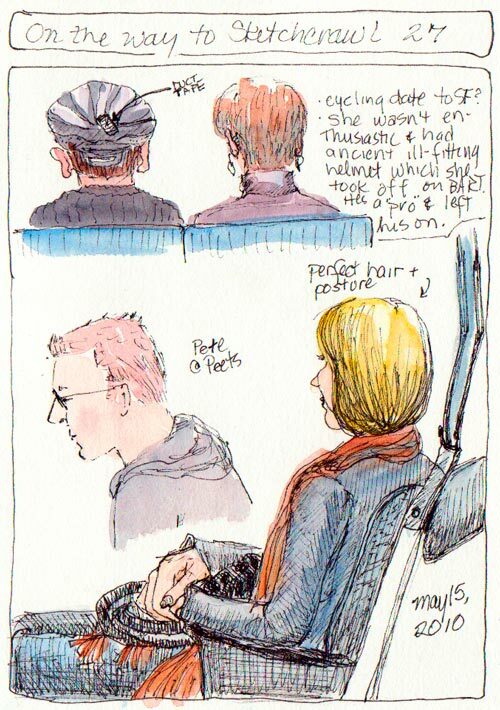 The guy in the middle above is Pete Scully, sketched outside Peets’ Coffee at the Ferry Building. 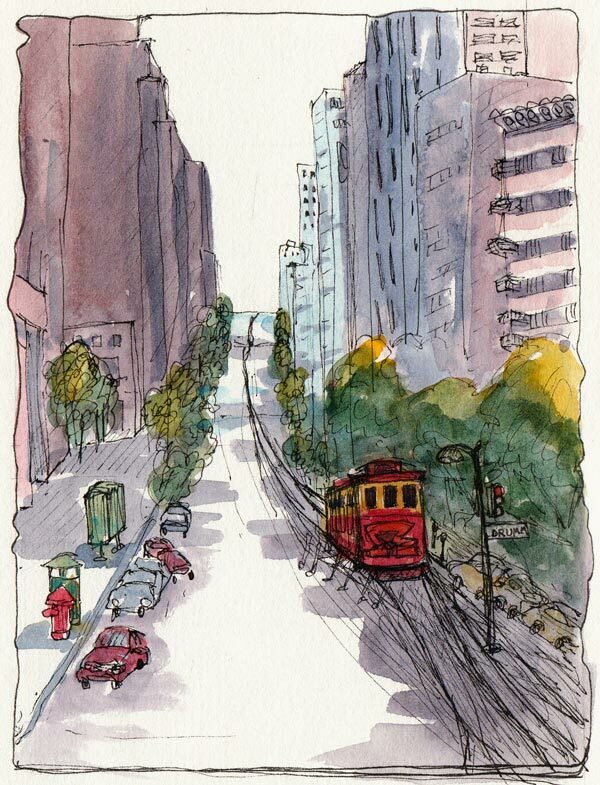 I had a great time sketching with him and my friend Sonia and other sketchcrawlers wandering the Financial District of SF. There were too many people at the Ferry Building, shopping at the upscale foodie shops, being annoying tourists, and/or waiting for ferries. I waited in a line of 20 women for the restroom and didn’t even bother trying to get a cup of coffee at Peets. While we waited for Enrico to give us the “Go,” we sketched the scene. Yes, I exaggerated the crowds and the closeness of the Bay Bridge. There’s a clarinetist (see Sketchcrawl 21 sketch) who is a permanent fixture at this spot, playing annoying screechy “music” that he segues into “Mary Had a Little Lamb” or “Popeye” whenever a kid approaches. Moms and their tots stop and dance while dads take photos and stuff money in his case. I couldn’t wait to get away from the crowds. Pete had the brilliant idea of going to the top of the nearby Hyatt Regency Hotel to sketch the view from above. We tried to go to the top floor (17) but the elevator would only take us to 14. We met a bellman on 14 and he said you had to have a key card to get there. I brazenly asked if he had one and he said yes. “Could you take us there?” I asked. He opened the door and swiped his card and sent us on up. What a sweetie! I wish I’d thought to tip him. When we got off the elevator a gentleman informed us that the 360 degree-view-Regency Lounge was only for Regency Members and asked if we were members. I said no, but asked if we could just look at the view and draw pictures. He asked “For how long?” and I said “Oh, about 10-15 minutes” and he said OK. We were there for nearly an hour and nobody bothered us. We did tip him when we left and he invited us to help ourselves to any of the complimentary food and beverages but we declined. 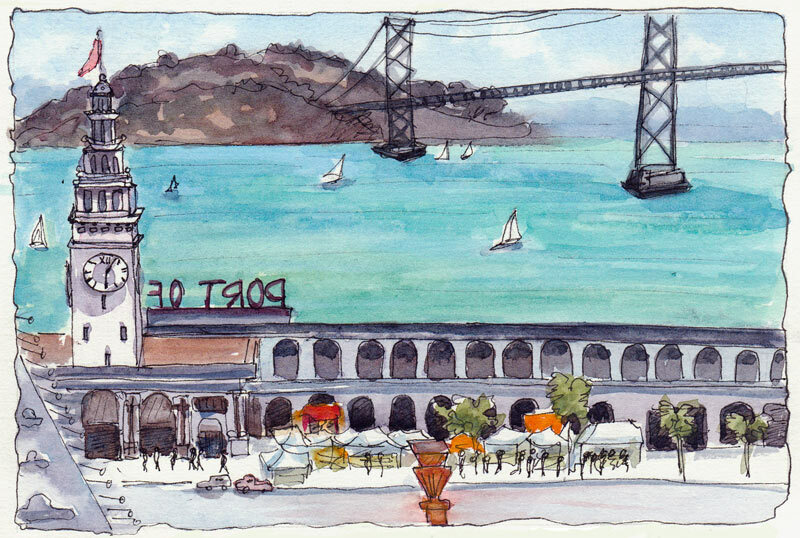 Sonia and I were hungry so while Pete started sketching a cable car we bought lunch at a deli across the street. We ate sitting at a bus stop, the only seats around. People kept coming up to us and asking about buses. Then I tried sketching the cable car and the hill it goes up and down. I was doing pretty good until I somehow planted a street light in the path of the street car. 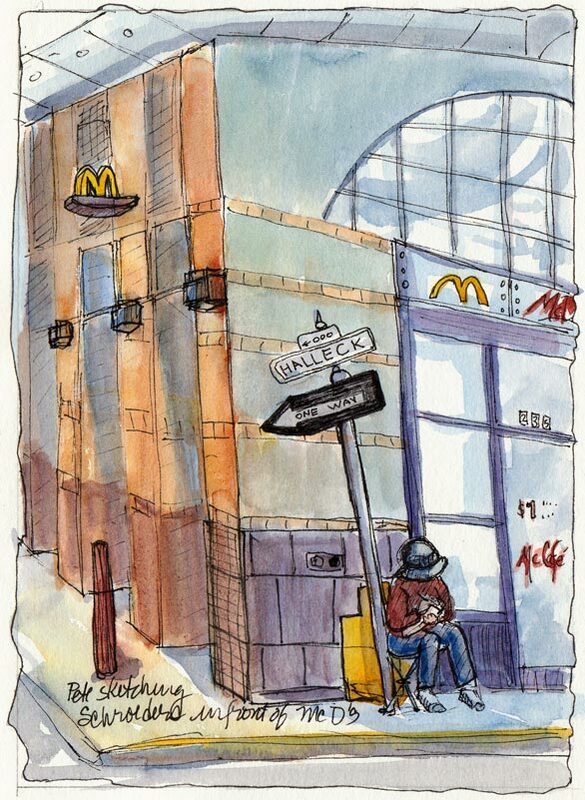 Heading north, Pete sketched an old German hofbrau that didn’t inspire me (though his sketch did, which I will link to when he posts it) so I drew him from across the street, sitting on his stool in front of McDonalds. I was tired and about ready to call it a day but managed one more sketch. I was more interested in the almost spiral staircase, the shadows, and odd architecture than the mannequins in their jungle print undies. I’m not a fan of the Victoria’s Secret brand or their ads and I think maybe it shows in the way I subconsciously made the mannequins look like they were giantesses, trapped in the store window and trying to get out. It was 4:00 and although the end-of-Sketchcrawl meetup was happening at 4:30 in Union Square I decided to just go home and relax rather than head towards more crowds. It was a great day! Great sketches, Jana. 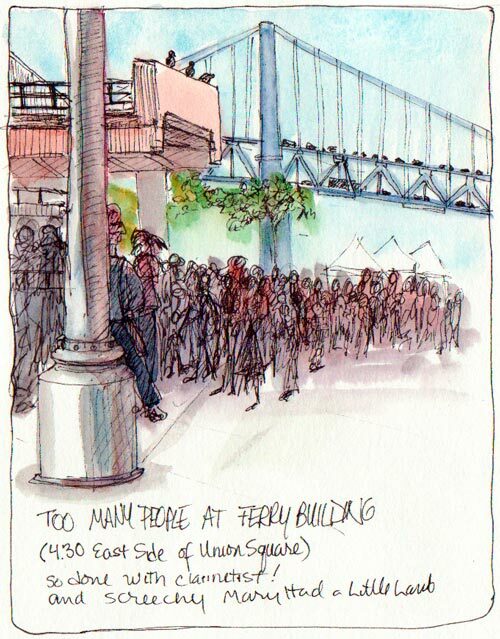 I especially like the crowd–wonderful wash– and bridge at the ferry building. Your fine persistence paid off to get you all to the top of the Hyatt Regency. Hey, we were in the same city at the same time yesterday. We went to see The Giants play and took BART over. Great sketches as always. I particularly like the caged mannequins. Wonderful sketchcrawl pictures! You guys really do move around lots during the hours that you spend together. Thanks Shirley, Even though I’m a fiercely independent person, for some reason when it comes to sketchcrawls I enjoy tagging along and letting my sketching buddies make the decisions about which way to head. We really didn’t walk all that far on Saturday, probably less than a mile each way. So Sketchcrawl. WHAT is that again? I loved the top of the building story. Way to go. Jana, what a wonderful day! Thanks for sharing these. I particularly like the cable car sketch. It has wonderful movement. Didn’t even notice the street lamp! I love these, and the narration that accompanies the sketches. Funny that you painted the mannequins as giants, I might have drawn anorectic, scrawny scarecrow types.. guess you’re not the only one with issues about VS!!! You may have exaggerated the crowd, but you did a fantastic job of capturing the busyness of the area! That one is my favorite. I love how you left out the details and washed them all with the violets and blues. I’m amazed how well that works! The rest are wonderful too, of course. It is always amazing how much you get done! How prolific you are, and what a super way to look at a streetscape. I did this kind of ‘crawl’ one time with a writing group I was leading. We walked down one narrow street in Geelong, writing little observations, poems, ideas for stories on the way – New Age shops, dolls, eateries, alleys, etc. A week later we went to the railway station. Next, to the former gaol – now that was scary! This is better than staying with a landscape for hours and hours.